Think of them as the "Men in Black" led by The Matrix's Mr. Smith, with effortless style and extraterrestrial superpowers. The Adjustment Bureau (in theaters March 4) is the Untouchable crew of men in old-school hats that watches over the entire world. Free will, what? "We are the people who make sure things happen according to plan," explains Richardson (played by Mad Men's John Slattery), who, along with his gang of celestial thugs, tries to keep David (played by Matt Damon) from falling in love with Elise (played by Emily Blunt) because it's not in the plan. "You ever wonder if it's right?" asks the bureau's rookie case officer, Harry (thankfully, played sans any trace of Bagger Vance by Anthony Mackie). Harry is David's magical pageboy who has been working his "case" for decades. But in a split-second slipup, Harry changes the entire course of David's plan, which includes the White House and saving the world. In the fight that is fate versus free will, Harry — the angel with a soft spot for true love — isn't sure his bosses always know what they're doing. In an interview with The Root, Juilliard-trained Mackie, who also starred on the cover of this month's Vanity Fair with Hollywood's actors and actresses of the moment, described his latest film as a "spellbinding action movie-thriller-love story." That's a lot of genre to squeeze into one movie, but The Adjustment Bureau has "the Chairman" on its side. The Root: Who is Harry? Is he an alien? A guardian angel? God? 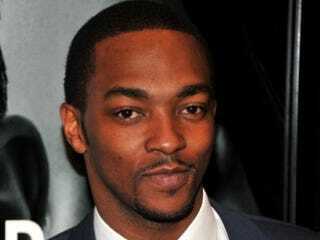 Anthony Mackie: He's a case officer. I tried to stay away from the whole idea of him being an angel, because when you put specific terms on people, the audience will then bring in their own preconceived notions. I wanted viewers to put whatever spin on Harry they liked. AM: Harry is a guy that's at the end of his rope. He's kind of burnt out. His day — his life — is dictated by how his work goes. He's definitely not the guy you'd like to have a beer with, but he's the guy you'd like to have on your side. He's the dude that can get stuff done. But he's no fun. TR: Your character is the only case officer who gets a first name. I thought that really humanized him. AM: That's because he's so young. Compared to the other officers in the bureau, Harry is just a rookie. But the guys in the Adjustment Bureau definitely started off human. I don't think anyone was born into that position. You have to be chosen. It's like Men in Black. Nobody's born to fight aliens; you're chosen to. Or you're chosen to chase Matt Damon around New York City. Same thing. TR: About the whole black-"angel"-helps-white-guy thing — one of the first movies I thought of was The Legend of Bagger Vance, also starring Matt Damon. Fortunately the film disavowed me of that notion almost immediately. There was so much diversity in the cast. AM: What's interesting about it and what [director George] Nolfi did when he was casting the movie, he said, "I want the bureau to look like New York City." So, you have Latino, you have Asian, you have black and you have white "case officers." In an earlier version of the film, "the Chairman" was a woman. Nolfi was very conscious of making the movie very ethnically diverse. TR: You've got this great line, "The whole world is turned upside down and you're looking for a woman." The notion that two people can be meant for each other is the heart of the film. Do you believe in that? AM: When it comes to women, nothing is fate. Everything is free will. Because there are so many things men can do, and so many things men can say to totally screw things up because women are emotional. It's all about the connection that women have with the person across the table from them. Unless you're like Fabio, most men are just sitting across that table thinking, "I hope I don't f—k this up." That's why most men are quiet when they're around women. TR: The Adjustment Bureau has some pretty deep stuff to say about free will versus fate. AM: I think the message of the movie is very clear: No matter what you're fated, your free will controls your destiny. We're all destined for greatness, but free will is what alters that destiny. You could be destined to provide free health care for all or you could be destined to make ketchup a vegetable. It's your free will that decides your choices.